Leafy Greens • LumiGrow ""
Research has shown that supplemental LED lighting provides myriad benefits for leafy green production. It’s possible to control plant height and leaf area using different wavelengths of light. Red light promotes growth, while blue light promotes chlorophyll concentrations, total flavonoid concentration, and antioxidant capacity of lettuce. Blue light also promotes primary and secondary metabolites in microgreens and baby leafy greens. Conclusive research has also proven that LumiGrow LEDs can be used as end of day supplemental lighting to enhance the leaf color and vibrancy, as well as boost overall quality of lettuce. 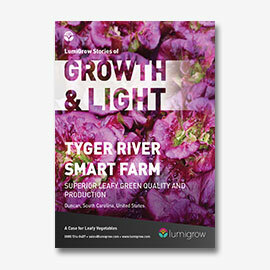 Learn how Tyger River Smart Farm is achieving superior leafy green quality and production. 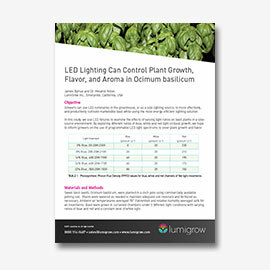 Take a look at LumiGrow research that explores how light can be used to control plant growth, flavor, and aroma.